See photos and a history of the Ammannsville community. The old Bethany community had its own post office from 1884 to 1891. Its school was located near the intersection of Old Lockhart Road and Old Smithville Road. The northern part of the community voted at Stella and the southern part voted at Ivy. When the post office was discontinued, its mail went to Stella. See photos of the school and citizens of Black Jack Springs. See photos and history of Bluff. The Bridge Valley Settlement was located in a large bend of Buckner’s Creek about three miles west of La Grange on the Flatonia Road, now known as FM 609. The area was first settled by Colonel John W.S. Dancy and Edward Manton, who came to Fayette County in the 1830s. They both had large land holdings in the area and were instrumental in trying to establish the town of Colorado City on the west side of the Colorado River at the La Bahia Crossing. This venture failed after John Moore successfully advertised for settlers to move to the new town of La Grange that he founded across the river, and flood waters inundated the proposed town site, which never progressed past the planning stage. German settlers came to the Bridge Valley area in the 1880s, farming the fertile land. At one time, the community had a mercantile store, a post office, blacksmith shop and a saloon, all owned by Anton Legler, the first postmaster, who later moved to Plum, Texas, where he established a gin, mercantile store and lumber business. A native of Bohemia, Legler first became a farmer in the Bluff area, worked at the Kreische Brewery, and eventually became a successful businessman. He was a skilled musician, who organized the Bridge Valley Band that won first place in 1892 at the Battle of Flowers’ festival in San Antonio. There was a one-room school in Bridge Valley that operated from circa 1880 until 1940. Some of the teachers were Walter Stierling, Jesse Jochec, Gilbert Jochec and J.J. Sula. In addition to Anton Legler, some of the earlier Czech-Moravian settlers included Joseph and Barbara Mozisek of Janovice, Moravia, who purchased a 250-acre farm. Joseph Bordovsky, the son of August and Rosie Bordovsky of Trojanovice, Moravia, who had settled at Cedar, married the daughter of Frank Baca, a native of Bordovice, Moravia, who also had land holdings in Bridge Valley. They settled on her father’s farm, eventually buying 100 acres of land from him. Joseph Bordovsky was a man of many trades, ultimately becoming very prosperous. In addition to being a watchmaker, he was a carpenter, farmer, blacksmith, gunsmith, craftsman, and trustee for the school. He also played the organ in the Catholic Church at Hostyn and was a musician in the Bridge Valley Band. Franz and Johanna Rainosek of Frenstat, Moravia were also early settlers. A few old homes belonging to the early settlers are still standing in the community that is now predominantly comprised of small farms and newer homes built on acreage carved out of the larger, older farms. All that is left of the Bridge Valley Settlement, as it was known, are the memories of a few older persons who had ties to the community that eventually disappeared off the map. Picturesquely situated on the base of a large bend of Buckner's Creek, lies the Bridge Valley settlement. West and south of it is Buckner's Creek. Behind Buckner's Creek to the south rise the wood-crowned hills of the Bluff. It is situated on the La Grange-Flationia [sic.] road, about three miles west of La Grange. The land is the fertile Buckner's Creek bottom, blackland, and to the north sandy postoak. The population is German and American. The first settlers were Col. John Dancy, Farquhar, Ed. Manton and the Kirks. It was settled in the forties. The German and Bohemian population came there in the eighties. In 1898 it became a postoffice. The voting is done at La Grange. Bridge Valley, being so near to La Grange, is a small place. It consists of a store and saloon, a blacksmith shop and a school. In A. Legler, the jovial postmaster and merchant of this place, the visitor will find a very entertaining talker. This early community, named for Aylett C. Buckner who claimed to be the first settler of Fayette County, was located between Cistern and West Point. In some historical accounts, the place was called Buckner's Trading Post. Whether Aylett Buckner lived there is conjecture. There is documentation, however, that his home was near the point where Buckner's Creek entered the Colorado River below the bluff south of La Grange. He Should Not Be Forgotten! About five miles west of La Grange lies the Cedar settlement. It lies on the La Grange Flatonia road on the north edge of the fertile Navidad Prairie. The name of Cedar was given to the settlement on account of the many cedars planted in its neighborhood. In old times, it used to be a very popular resort for amusement and it was known as such throughout the county. The land around Cedar is very fertile. The first settlers in the Cedar district were Bill Lewis, John Lewis, Ferrill, Dr. Denker [Dencker], Franke and Allen. They settled there in the forties. Cedar consists of a store, saloon and postoffice combined, also of one large hall. It has a physician. It is not a voting place, but is a post-office. The people vote at the Bluff box. The Cedar Maennerchor which holds its meetings at O'Quinn takes care of the social side of life. Cedar also has a lodge of the Sons of Hermann. The population of Cedar is mostly German. Cedar was located on the La Bahia Road five miles west of La Grange on FM 609. This community is revealed only by its cemetery, but at one time was popular for being a resort for amusements. it was settled in the 18402 by the Lewis Family, Dr, Denker and others. It once had a store, post office, saloon and a large dance hall. Photo contributed by Mike Gohlke. Having ascended an eminence almost anstanter, we were at the excellent and well imporved farm of J. E. Lewis, Esq. While his dwelling is comfortable, he has a mill and gin in operation; and what adds to the interest, both of the Squire's farm and many others of the neighborhood, is, that they are enclosed with cedar rails. Cedar is situated five miles west of LaGrange, and is the centre of an industrious, thrifty and energetic community. The soil in this locality is black wax and sandy, and yields, in ordinary seasons, from one-half to one bale of cotton, thirty-five bushels corn, sixty bushels oats and from three hundred to four hundred bushels sweet potatoes per acre. The principal market for this neighborhood has been Schulenburg; but since the completion of the La Grange Branch, a noticeable change has taken place, which, no doubt, will be greatly increased, when the new iron bridge about to be erected over Buckner's Creek is completed. The topography of our locality is undulating and well suited to agriculture; no ponds or marshes here to generate minsma and breed sickness. It is no place for physicians; three having tried to build up a practice in the past six years had to abandon the place in disgust, not possessing the self sustaining powers of Dr. Tanner. As an evidence of the healthfulness of this locality, we will state that the first grave that was dug in our graveyard was in 1839, and the whole country for ten and fifteen miles around brought their dead there to be buried; yet from that time to the present it will not average more than two burials per year. Timber and building stone are abundant and plenty of good water can be had by digging from twenty to forty feet. Fruit culture in this vicinity is in its infancy, yet, with the same care and attention it receives in the North, would meet with better success than at present. The only one here that takes any pride in the cultivation of fruit is that enterprising and energetic farmer, Mr. Edward Spencer, who, in addition to the sixty acres he has under cultivation, has a small experimental orchard of apples, peaches, pears, etc., together with nearly a dozen different varieties of grapes. His peaches, pears and grapes have done excellent, but his apples have not done so well. This year he proposes sowing six acres in Austin grass as an experiment. Bee culture is beginning to come into favor in this neighborhood. Mr. Jessie Lewis, Mr. James Lewis and Mr. Mills are all interested in bee culture; but when it comes to the greatest number of hives, Mr. Jessie Lewis is the boss apiarist. Mr. Julius Mittman is our gentlemanly and accomodating merchant and postmaster, who has a well selected stock of goods that he should make known to the people generally by contributing an Ad to the columns of the Journal. Adjoining Mr. Mittman's store is the Concordia Hall, in which the "Club" occasionally assemble to "trip the light fantastic toe." 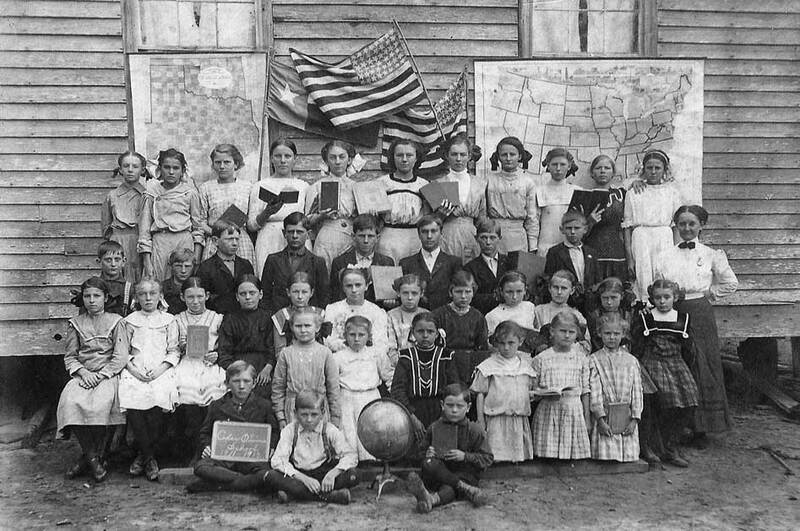 Mary Kubala (later Prilop), is in the front row of little girls kneeling, 2nd from the right, holding the open book. In the back row of standing girls, 3rd from the left, is one of her older sisters, either Anna Kubala (later Rohan) or Charlotte Kubala (later Stavinoha). Click on photo for larger view. Photo provided by Nell Lindquist. Can you identify others? Seeing some time ago in your columns a request for neighborhoods to give you a small synopsis of the farming interests and wellfare [sic.] generally, I take this method of giving you a short sketch of the surroundings of Center Grove church, two miles north of Weimar, on the head waters of the little Harvey's creek. We have a nice church 26X56, preaching twice a month on the 1st, by Rev. Allen Walker, Presbyterian, on the 3rd, by the Rev. Ike Sellers, Baptist, which is largely attended. Our Baptist membership numbers about 200, our private school numbers about at least 35 to 40. We had a good rain on last Friday and Saturday nights needed. It seems to make all nature smile. Crops have been well worked and present a beauty within itself. our lands are of a black sandy loam quick of production and a bird's eye view of our county, is what you might term as elevated plateau interspersed with beautiful little running streams teeming with little fishes, dotted along their banks, and mots [sic.] of timber with nice little cottages, fine looking women and fat babies. The Baptist Association convenes on the 1st Sabbath in July, embraces the time at Center Grovelikely a camp meeting during the time. Colony is situated eight miles northwest of Flatonia. The surrounding country is sandy and loamy postak. It has one store, a blacksmith shop and three churches. The Baptist Church is in charge of Rev. J. M. Frierson, the Christian Church is in charge of Rev. G. M. D. Thomason, and the Methodist Church is at present without a preacher. It was settled in 1880 by Mississippians; it was named by them Colony as colony of Mississippians. The population is American. Colorado City, on the west bank of the Colorado River directly opposite La Grange in central Fayette County, never progressed beyond the plat stage. The town was designed in the late 1830s by John W. S. Dancy and associate promoters to rival the promotion of La Grange by John H. Moore. Elaborate plans called for the development of 5,000 acres with 156 blocks of residential and commercial property. The proposed city was unanimously selected by the Congress as the capital of the Republic of Texas, but President Sam Houston vetoed the proposal because he wanted the capital to remain in Houston. When Mirabeau B. Lamar succeeded Houston, he selected the site of what is now Austin as the capital, and the plan for Colorado City languished. One of the frequent floods along the Colorado River made the plan unfeasible, and most of the area was later included in the decentralized community of Bluff. Colorado City was a pipe dream of John Dancy in the 1840s. When the search for a new capital of the Republic of Texas began, Dancy incorporated a town, with the hope of it becoming the capitol, on his land across the river from La Grange. The town never grew beyond several houses, but the Samuel Maverick family, from which the term "Maverick" originated, lived there for several years. See Ellinger history and town map. Elm Grove is a small community located between Cistern and Waelder on FM 1115. It has a Baptist church and was named after the elm trees that grew there in groves. Elm Grove, in the western part of the county, was a ranching community. Large herds of cattle were supplied to the large trail drives to Kansas in the 1860s and 1870s. When the drives ended, cotton took over, which was then replaced once again by cattle after the railroads arrived. The high mineral content of the groundwater supposrted a health resort for many years. Engle lies midway between Schulenburg and Flatonia on the Southern Pacific Railroad. North of it is postoak, south of it rich, fertile prairie land. It is a thriving little town' has a postoffice. The voting is done at Mulberry, a schoolhouse thus named in its neighborhood. it consists of two general merchandise stores, three saloons, one blacksmith shop, one photograph gallery, one tinsmith shop and one lumber yard. The population is German and Bohemian. Amongst the first settlers of the place are I. J. Gallia, ____ Bucek, L. Melcher. Old settlers in the neighborhood are Chas. Hertel, Chris. Brueggemann and ___ Olle. Mr. I. J. Gallia is an old popular merchant of that place, deals also in real estate and serves as notary public. Mr. Louis Melcher has a first-class saloon and a fine photograph gallery. Mr. I. J. Gallia was the first merchant in that place and built his business there in 1890. Fayette County, Texas Heritage, published by Curtis Media, Inc. in 1996, was the source of some of the community information on this page.